When you need an appetizer that wows on the plate as much as it wows on taste? This Pear & Roasted Beet Salad with Honey Vinaigrette is delicious, seasonal, and perfect for entertaining. This Pear & Roasted Beet Salad with Honey Vinaigrette is a showstopping first course. Set several on a cutting board or platter for an impressive buffet display, or serve single pears on salad plates to wow your guests. Sometimes I just can’t resist making an entrance. Or, I can’t resist having my food make one, anyway. This Pear & Roasted Beet Salad is equally delicious if you plate it by slicing the beets and pears lengthwise, add a pretty dollop of the cheese and drizzle the vinaigrette over the top, but it’s not nearly as fun. The secret to getting the pears to stay stable on the plate is to cut a slice off the bottom so the pear is sitting flat. I use roasted beets for this recipe, and you can often find them pre-roasted at premium grocery stores to make prep easier. Although roasting beets is so ridiculously easy, I usually do it myself. I’ve included my recipe for that too. When you need an appetizer that wows on the plate as much as it wows on taste, this salad won't let you down. This Pear & Roasted Beet Salad with Honey Vinaigrette is delicious, seasonal, and perfect for entertaining. Place the goat cheese in a small bowl and stir in 1 teaspoon of the honey until smooth. Set aside. In a medium bowl, whisk together the remaining honey, vinegar, olive oil and mustard. Season the vinaigrette with salt and pepper to taste. Set aside. 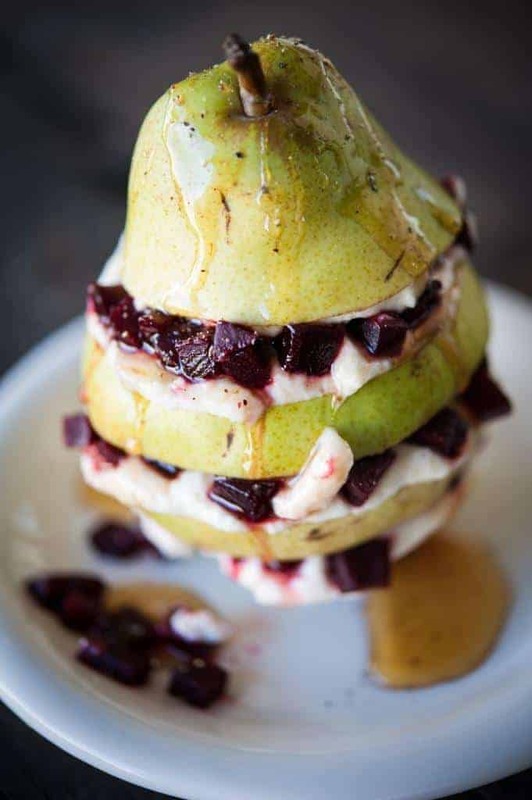 Place the bottom slice of pear on a salad plate, and spread a thin layer of the goat cheese on top. 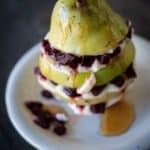 Add an even layer of the diced beets, and spread goat cheese on the underside of the next pear slice, and stack it on top. Repeat the layering process with the remaining pear sections until the pear is reassembled. Drizzle with the honey vinaigrette and finish with a bit more pepper. Repeat with the other pear and remaining beets and cheese. Serve immediately. This entry was posted in Appetizers & Snacks, Recipes, Salads & Dressings, Side Dishes and tagged appetizer, food allergies, G-Free Foodie, gluten free cooking, gluten free holidays, in season, kc cornwell, Salad. Bookmark the permalink.